Fish are naturally attracted to structures that provide protection, especially during winter season when natural underwater weeds are scarce. 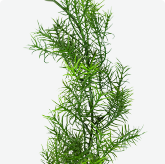 Reel Weeds artificial foliage is an easy solution that draws fish towards your fishing site. 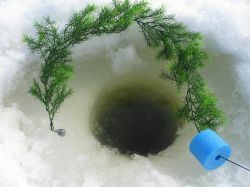 Simply drop several strings of Reel Weeds structures into your ice fishing holes and watch the fish gather! 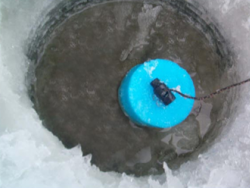 Built from a environmentally-friendly plastic that performs even under the harshest of conditions, Reel Weeds for ice fishing will have you wondering how you ever fished without them! 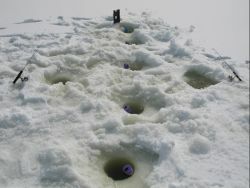 The ice fishing community excitedly takes advantage of Reel Weeds by drilling extra holes and dropping their artificial structure down into the water column, supporting them with a cord and ice-free float system that prevents them from freezing in the hole. Fishermen quickly developed their favorite weed bed patterns of Reel Weeds and learned how to funnel and draw fish in from long distances. It just makes sense. Fish seek out structure for food and protection. When you introduce structure into an area void or nearly void of structure, fish are drawn to it, like ducks to decoys - STRUCTURE IS EVERYTHING! A must-have for any fisherman that uses underwater cameras! 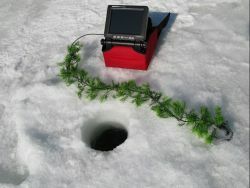 Any time you are using an underwater camera, be sure to wrap a Reel Weed around it. Not only does it camouflage the unfamiliar structure, it will actually draw fish to your camera! Easily attach to any camera with twist or cable ties. For additional uses, visit our Reel Weeds™ Applications page. Watch Reel Weeds™ in Action!